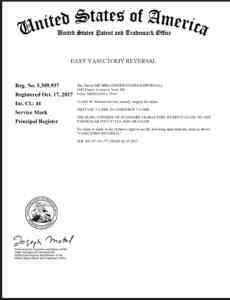 Easy Vasectomy ReversalⓇ has a registered trademark from the United States Patent and Trademark Office, and it is a minimal invasive office procedure with no scalpel and no needle techniques. OSMC developed a powerful website, EZvasectomy.com, with rich information on vasectomy reversal. Dr. Shu does the same day consultation to finalize the consultation on the day of surgery, so the patients don’t need another trip for the initial consultation if they live far away or out-of-state. Moreover, the patients are able to register their vasectomy reversal procedures by filling out the online registration form in the website. A vasectomy reversal is a microsurgical procedure that reconnects the vas deferens where it was interrupted by a vasectomy. Although vasectomy has historically been considered a permanent sterilization procedure, current advances in microsurgery over the past 15 years have greatly improved the success rate of vasectomy reversal. The common reasons for vasectomy reversal are a new relationship or remarriage following a divorce or having a change of heart and a desire for more children. There are occasional unfortunate individuals who have lost their children and want to have more children. Easy Vasectomy reversal® procedure is performed in the One Stop Medical Center on a come-and-go basis. The actual operating time for a vasectomy reversal procedure can range from 2 to 2.5 hours, depending on its complexity. A local anesthetic is used. The patient returns home or to a hotel room after the vasectomy reversal procedure, but Dr. Shu requests that out-of-town patients stay in the Twin Cities area for at least one day following the vasectomy reversal procedure before returning home. A preoperative consultation is an important step in planning on vasectomy reversal. Thanks to the Internet, the patients can get all information on vasectomy reversal from a well-designed high quality website. The following topics related to vasectomy reversal are addresses in our website and will be discussed in a preoperative vasectomy reversal consultation.